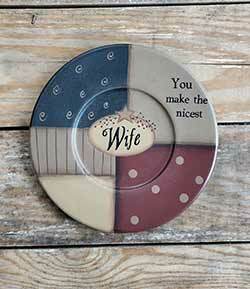 Primitive plates and trays in Family themes - moms, grandmas, aunts, sisters, dad, and more! Perfect for a shelf, mantle, or perched on a wall hanger, this hand painted decorative wood plate is a heart warming gift of folk art for the special mom in your life! Quote reads: "A SISTER is a gift to the heart. A friend to the spirit. A golden thread to the meaning of life." This primitive wooden square plate features a center star and berry vine border, and color palette of mustard, tan, burgundy, and black. Center reads "It's all about family." Being a Mom Primitive Plate, by The Hearthside Collection. 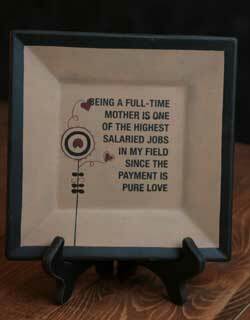 This hand-painted woodenware plate reads "Being a full-time mom is one of the highest salaried jobs in my field because the payment is pure love." 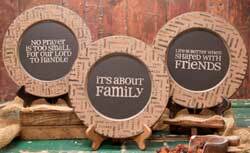 Carved Family Oval Tray, by The Hearthside Collection. 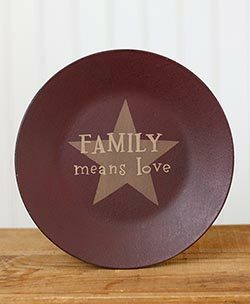 This primitive wooden plate has hand-painted stars and vines, and a carved sentiment that reads: Our family is a circle of strength and love. Cherish Family Primitive Plate with Bluebird, by The Hearthside Collection. This primitive home decor plate features sweet little bluebird, with a flag reading "Cherish Family." Color palette is muted green and black. This primitive wooden plate set features blue flowers, green leaves, and hearts that say "Faith First," and "Family Forever." 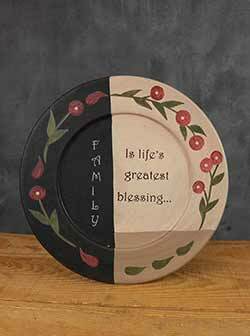 Family Blessing Primitive Plate, by The Hearthside Collection. This folk art plate features a red, black, and tan color palette, with pretty red flowers. Reads: "Family is life's greatest blessing." 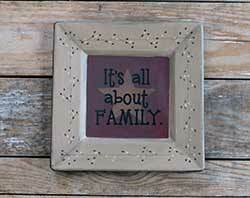 Family Distressed Plates, a Barbara Lloyd design for The Hearthside Collection. Set of three inspirational plates, painted and distressed in black; lettering is printed on vintage-style newsprint decorative paper and sealed to the center of the plate. Measures 9.5 inches in diameter. Pairs well alone in a plate stand or all together in a plate rack (sold separately). As with all Hearthside plates, these are distressed for a rustic look, adding to the individual charm. Decorative use only (do not use with food). This primitive wooden plate features tag and berry sprig design, with burgundy border. Center reads "Family is a little world created by love." Family Picks You Up Plate, a Barbara Lloyd design for The Hearthside Collection. Painted and distressed in black; lettering is printed on decorative paper in a black, white, and grey color palette and sealed to the center of the plate. 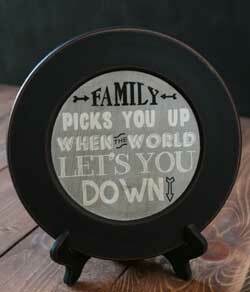 Reads: Family picks you up whtn the world lets you down. Measures 9.5 inches in diameter. Made of pressed wood, intentionally distressed for a rustic look. Decorative use only (do not use with food). Plate stands also available! Perfect for the country primitive look, this hand painted decorative wood plate will look great on your mantel or shelf! Would look great next to family photos! 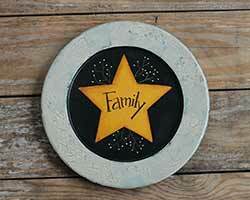 This primitive wooden shallow bowl features folk style stars against a mustard/tan background. Center reads "family." Father Plate, by The Hearthside Collection. 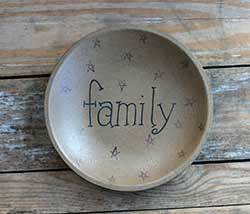 This hand-painted woodenware plate reads: Father, a son's first hero, a daughter's first love. Plate is black with tan berry vine. A Sabrina Wingren design. Measures 10 x 10 inches. Decorative use only (don't use with food). Plate stands also available! 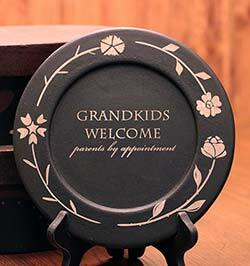 Grandkids Welcome Plate, by The Hearthside Collection. Painted and distressed plate, featuring ivory leaves and flowers against a black background. Reads: "Grandkids welcome, parents by appointment." Measures 8.5 inches. 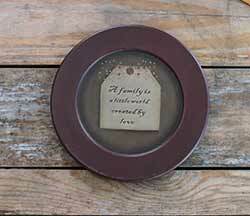 Hope, Family, Love Plates, by The Hearthside Collection. Set of three plates, painted in a palette of black and tan. They read "Family: nothing is more beautiful," "Love: is a glimpse of heaven," and "Hope: Storms pass." A Barbara Lloyd designs. Measures 6 x 6 inches. Made of hand-painted pressed wood, antiqued and distressed for an aged, rustic look. Decorative use only (not food safe). Plate stands also available (sold separately). In This Together Plate, by The Hearthside Collection. Rim is painted and distressed in burgundy red, with distressed lettering printed and decoupaged to the center. 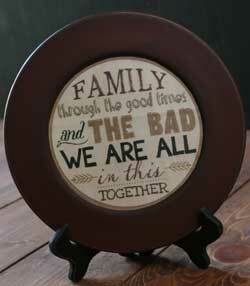 Reads: Family through the good times and the bad, we're all in this together. A Barbara Lloyd design. Measures 9.5 inches in diameter. Made of hand-painted pressed-wood, distressed and aged for a rustic look. Decorative use only (don't use with food). Plate stand also available (sold separately). It's All About Plates, by The Hearthside Collection. A Barbara Lloyd Design. 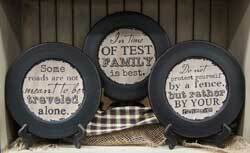 Set of 3 plates in a black and tan color palette, with stamped wording along the rim. One reads: No prayer is too small for our Lord to handle; one says: It's all about family; the last reads: Life is better when shared with friends. Measures 9.5 inches. Made of hand-painted pressed wood, distressed and aged for a rustic look. It's One of Those Days Plate, a Michelle Kildow design for The Hearthside Collection. Painted and distressed plate, featuring green leaves and ivory polka dot flowers against a dark brown background with black edge. 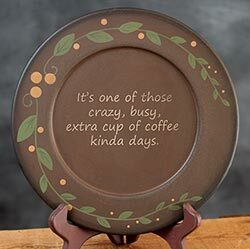 Reads: "It's one of those crazy, busy, extra cup of coffee kinda days." Measures 9.5 inches. 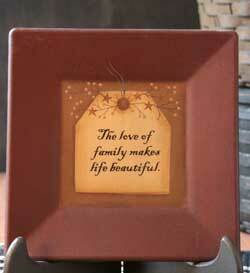 Love of Family Tag Plate, by The Hearthside Collection. Features a painted tag and berry sprig, and a burgundy/tan color palette. Reads: "The love of family makes life beautiful." A Barbara Lloyd Design. Measures 8 inches. Made of hand-painted pressed wood, distressed and aged for an intentionally imperfect and rustic look. Decorative use only (not food safe). Plate stands also available (sold separately). Mommy's Mental Vacation Plate, a Michelle Kildow design for The Hearthside Collection. Reads: "T.V. 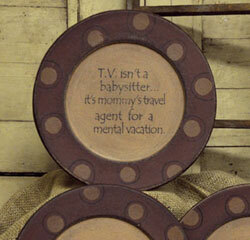 isn't a babysitter...it's mommy's travel agent for a mental vacation." Measures approx 9.5 inches in diameter. A mustard/tan color in the center and burgundy rim, with whimsical tan and black polka dots. As with all Hearthside items, this plate is intentionally distressed for a rustic look. Decorative use only (do not use with food). Plate stands also available (sold separately). Mother Plate, by The Hearthside Collection. 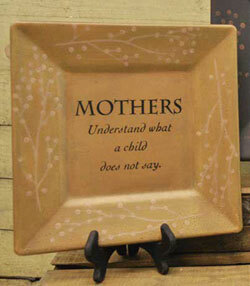 This hand-painted woodenware plate reads: Mothers understand what a child does not say. Plate is mustard with cream berry sprigs. A Sabrina Wingren design. Measures 10 x 10 inches. Decorative use only (don't use with food). Plate stands also available! Photo is courtesy of The Hearthside Collection. We take special orders from their whole collection! Nana Knows Best Plate, a Michelle Kildow design for The Hearthside Collection. 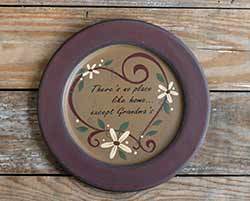 Painted and distressed plate with painted burgundy flowers, tan rim, and burgundy center. 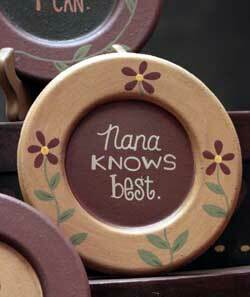 Reads: "Nana knows best." Measures 6 inches. Made of hand-painted pressed wood, antiqued and distressed for an aged, rustic look. Decorative use only (not food safe). Plate stands also available (sold separately). 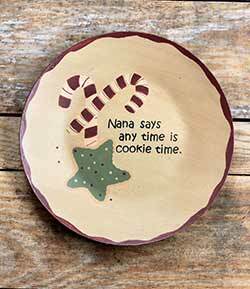 This primitive plate features hand painted cookies and reads: Nana says any time is cookie time. Painted and distressed plate with burgundy rim and mustard center. Reads: There's no place like home...except Grandma's! Nobody Like Nana Plate, a Michelle Kildow design for The Hearthside Collection. Painted and distressed plate with painted ivory flower, burgundy rim, and tan center. 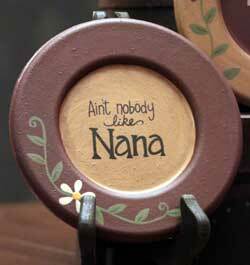 Reads: "Ain't nobody like nana." Measures 6 inches. Made of hand-painted pressed wood, antiqued and distressed for an aged, rustic look. Decorative use only (not food safe). Plate stands also available (sold separately). Features hand-painted gifts, snow, and holly leaves. 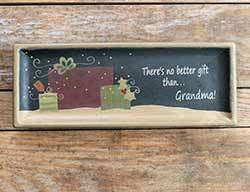 Reads "There's no better gift than...Grandma." They Shall Be Called Grandma Plate, by The Hearthside Collection. 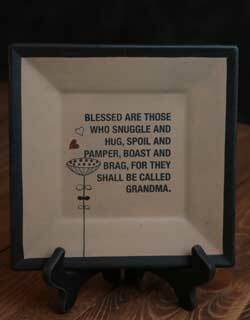 This hand-painted woodenware plate reads "Blessed are those who snuggle and hug, spoil and pamper, boast and brag, for they shall be called Grandma." 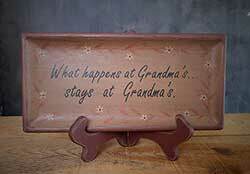 What Happens at Grandma's Primitive Tray, by The Hearthside Collection. A sweet gift for grandma for her shelf or living room, this primitive wood tray reads "What happens at grandma's stays at grandmas! 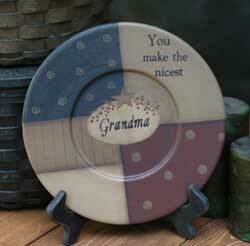 You Make The Nicest Grandma Plate, by Barbara Lloyd for The Hearthside Collection. This primitive plate is painted in black, tan, and burgundy. Reads: You Make the Nicest...Grandma. Measures 8.5 inches in diameter. Decorative use only. 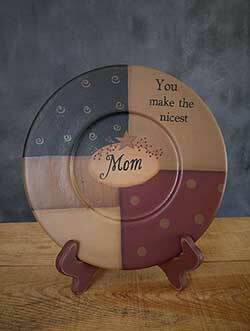 You Make The Nicest Mom Plate, by The Hearthside Collection. 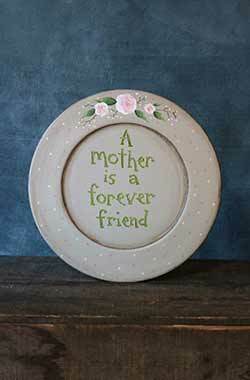 Give a meaningful gift to a country decor loving mom with this primitive wood plate with thoughtful saying! Says: "You make the nicest mom." This primitive plate is painted in black, tan, and burgundy. Reads: You Make the Nicest...Wife. Measures 8.5 inches in diameter. 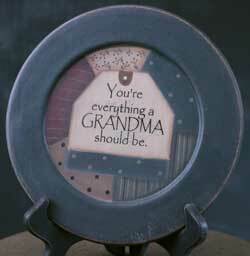 You're Everything Grandma Plate, by The Hearthside Collection. A Barbara Lloyd Design. Reads: "You're everything a grandma should be." Measures 8.5 inches. Made of hand-painted pressed wood, distressed and aged for a rustic look. Decorative use only (not food safe). Plate stands also available (sold separately). 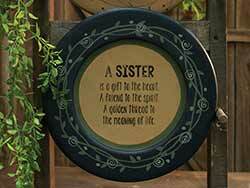 You're Everything Sister Plate, by The Hearthside Collection. A Barbara Lloyd Design. 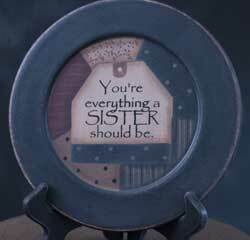 Reads: "You're everything a sister should be." Measures 8.5 inches. Made of hand-painted pressed wood, distressed and aged for a rustic look. Decorative use only (not food safe). Plate stands also available (sold separately).